Basic Statistics for Business and Economics 8 Edition The 8th edition of Lind/Marchal/Wathen: Basic Statistics for Business and Economics, is a step-by-step approach that enhances student performance, accelerates preparedness and improves motivation for the student taking a business statistics course. The main objective of the text is to provide students majoring in all fields of business administration with an introductory survey of the many applications of descriptive and inferential statistics. The relevant approach taken in this text relates to the college students today as they will receive the information that is important to them in this class as well as their future careers. 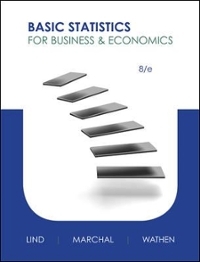 Understanding the concepts, seeing and doing plenty of examples and exercises, and comprehending the application of statistical methods in business and economics are the focus of this book.